With the traveling this past week, there’s not much quilting progress to report. However, I made some purchases while in Midland, but NOT fabric. I went to Hobby Lobby in search of some applique supplies recommended by Sharon Schamber. I bought some Liquid Stitch and some basting glue. I also bought some Sulky medium weight water soluble stabilizer, for a freeform scarf project I saw on Fons & Porter. Who knows when I will have time to play with it, but at least I have some stuff…lol. I also went to Barnes & Noble and picked up the latest edition of Quilter’s Home. Mark’s Quiltzilla article is hysterical! I also bought a mag I hadn’t seen before, Quilting Arts. And I found a copy of The Persian Pickle Club. I’ve already read it and enjoyed every minute. We had a freeze warning last night, and I had a little grape tomato plant that already had some blooms and two tiny tomatoes on it. I carefully put some batting scraps over it and around it to protect it, and when I uncovered it this morning, I discovered that in the process of trying to protect it, I knocked off the little stem with the ‘maters. Waaaa! And it only got to 34 last night…shoulda left it alone. Now, I’m hoping someone can solve a mystery for me. I have this plant in the front yard. It was here when we moved in…can anyone tell me what it is? It blooms early every spring. 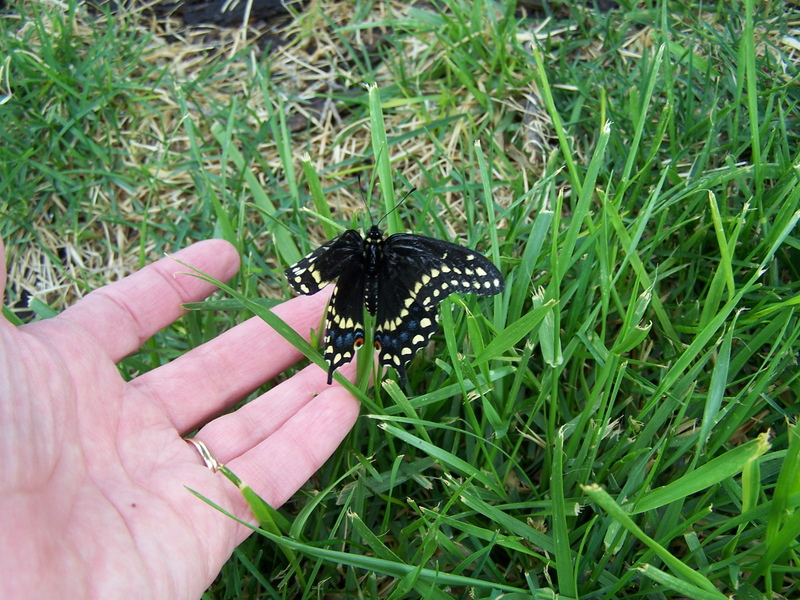 Before I left town last Sunday, I was in my yard filling my bird feeders, and almost stepped on this in the grass. Thank goodness I saw it! 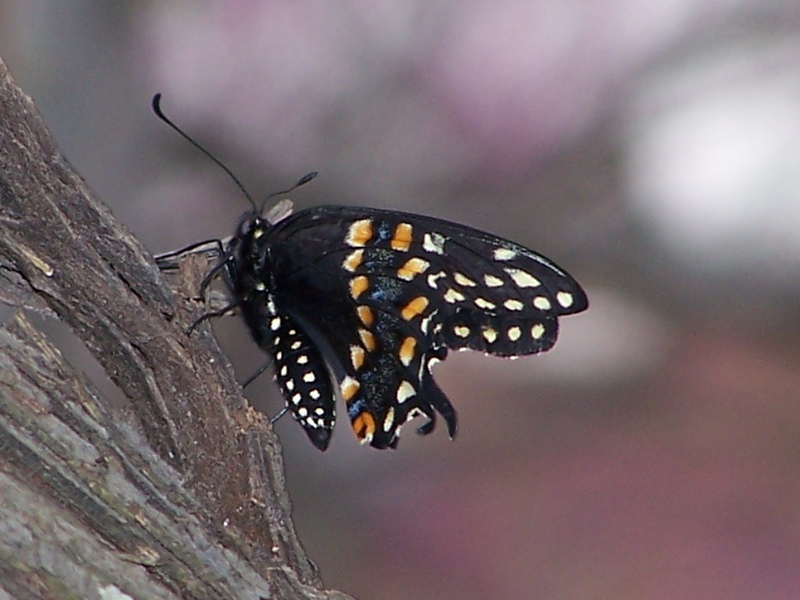 My first Swallowtail Butterfly of the year. Apparently, it had recently come out of it’s chrysalis, and was trying to dry out it’s wings. I helped it get to higher ground. I’m glad I already have some parsley coming up, and I have planted some dill seeds already, just so they can lay their eggs on it, and I will have more caterpillars this year. 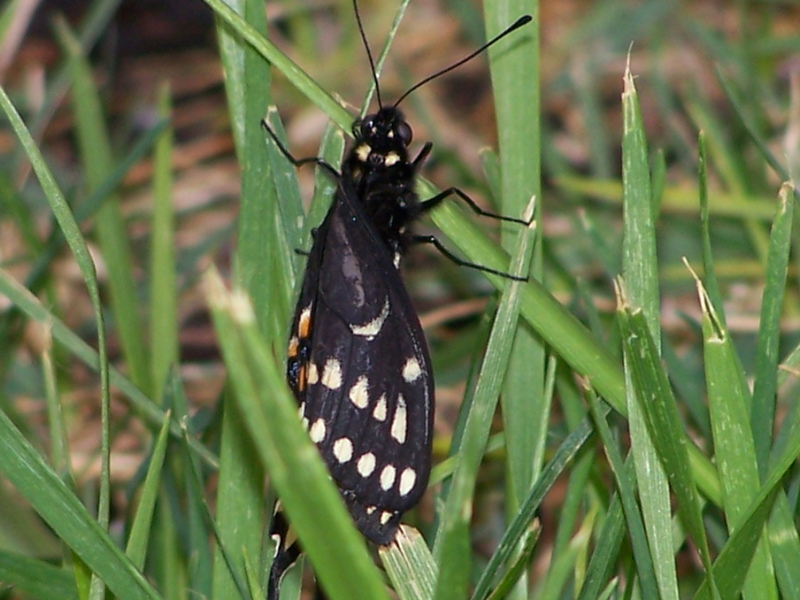 If you have found my blog, by searching for what kind of caterpillars are eating your dill or your parsley, they are Swallowtail butterflies. Please spare a bit of your garden for them. Give them a chance to find their wings. It won’t be long, and I bet I have pics of it’s offspring munching happily in my garden. Have a great day! In the pic it looks like an azalea but I’m not absolutely sure. The butterfly sure is pretty. 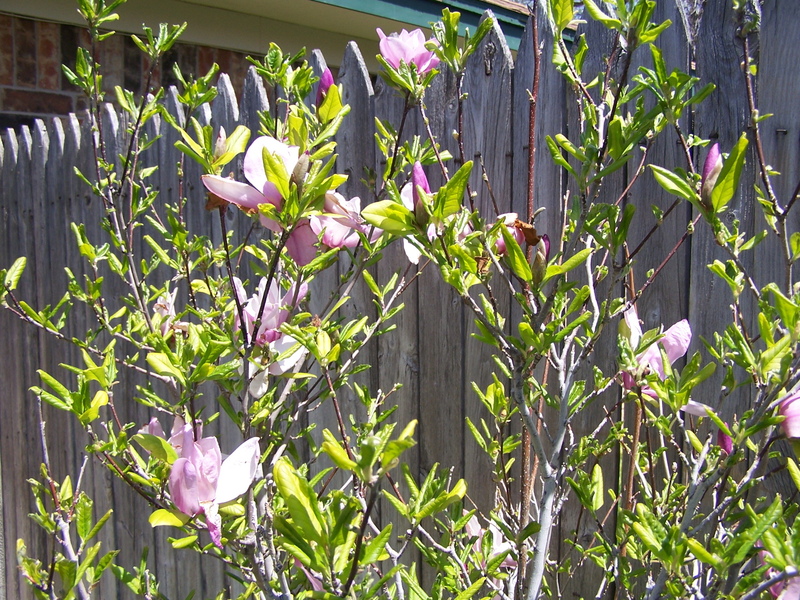 It appears to be a Magnolia Bush/Tree – here is a link with pics of similiar blossoms. Recently starting reading your blog and enjoy your pics and comments. Thank you for sharing. 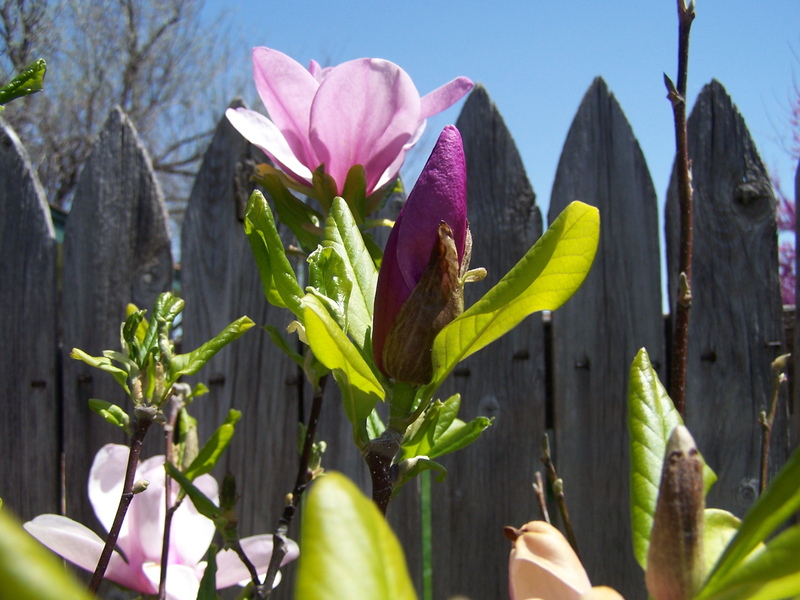 I think it’s a mary jane magnolia bush…. but I’m not a master gardner nor do I play one on tv. I love them! Lucky you!! Sorry about the tomato plant. At least you can still go find a replacement if needed this early in the season!!!! My vote is with a magnolia. One of the tulip varieties. Thanks, y’all! My mystery is solved! A magnolia bush it is! Definately a magnolia, aren’t they beautiful!